If you or someone you know is moving this summer, then the 2017 Toyota Tacoma is the best friend you have can have when it comes to hauling furniture and other things around. Of course, you might just want to go out and commit Acts of Truck with your 2017 Toyota Tacoma instead. According to Toyota, Acts of Truck is when you see opportunities that others do not. Like when you see a fallen tree in the road, and you are more than happy to pull out the chainsaw, cut it up into little pieces and load it into the back of your truck. Of course, there are any number of these acts that your Tacoma can perform. From moving your friend across town to hauling the boat to your favourite fishing spot for a weekend of camping and telling stories, the Toyota Tacoma is made for this. Over 80 years of truck history has been put into the development of the Tacoma, and there are nine models to choose from. Even the smallest in the lineup, the 4×2 Access Cab 6A Tacoma, is tough and ready to take on any work you throw its way. It seats four and comes with a reinforced locking tailgate on its 6-foot bed for the best tailgate parties. You can drop that tailgate with only two fingers, or you can take it completely off if you need a longer bed. It comes with a backup camera and Bluetooth® capability. The 2.7 litre 4-cylinder is capable of towing 1,590 kg and a payload of 680 kg. For those moments when you are off on a real adventure, it comes standard with a GoPro® mount. You can record it all and share it around the campfire later. In addition to the 4×2, the Tacoma lineup includes 4×4, double cab and TRD packages. No matter which package you choose, you will like the way that it handles. 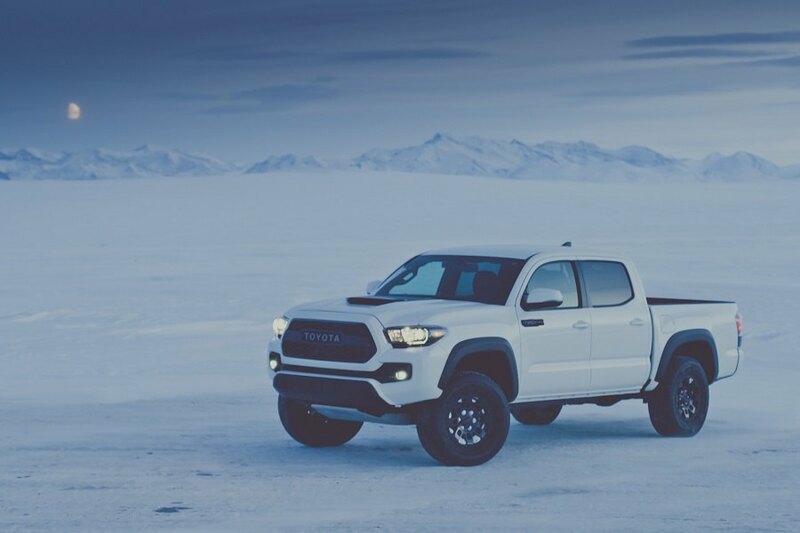 All of the Tacomas have been built on a triple tech frame that is constructed to improve the solidity of the truck while making it easy to handle. This also is instrumental in making the truck ride better. The bed can take on the biggest loads you can hold because it has been constructed of sheet-moulded composite that is fibre reinforced for a tough, durable surface that will resist dents and corrosion. Depending on what package you put on your Tacoma, you could have features like an in-bed power outlet. All models come with double wall construction, bed tie downs and cleats. You will love the cabin layout. The driver’s seat puts you right in the middle of all of the action. The dash has been laid out to put everything within your focus or at your fingertips without the need to look away from the road. The gauges are easy to read at a glance, and the steering wheel is equipped with controls for everything from your cruise to your infotainment centre. The cab is quiet and comes with sport front seats for a comfortable ride no matter what the terrain. The seats come in either leather or a premium fabric. A power slider is also available, as is a power moonroof. If you need more room in the double cab, then the 60/40 split drop seats will fold up for you, giving you more storage.